Won't someone please think of the fake gorillas? Best opening line ever: "If you notice a chained gorilla riding around town in a golf cart this week, don’t be alarmed." That's what LivingSocial told us, anyway. 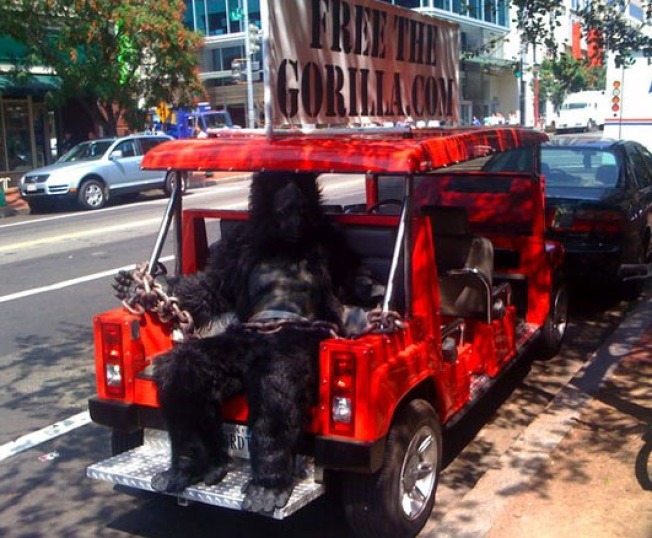 A new company called LivingSocial is driving around a poor gorilla-costumed dude in this heat wave, which kinda proves that timing is everything (or nothing) in publicity stunts. LivingSocial offers daily deals of up to 50 percent off D.C. restos, spas, sports events and more. Recent coupons include half off D.C. United tickets and half off your bill at Cashion's Eat Place, Rhino Bar and Red Velvet Cupcakery. Yeah, they had us at "Cupcakery." But where's the gorilla come into the picture? We're not exactly sure, but they say that they'll release the poor, poor (fake human) creature once D.C. has saved $1 million (or it's Friday, whichever comes first). We hear the gorilla is spending most of his time in Georgetown and Dupont. Sign up to receive the e-mailed deals at http://FreetheGorilla.com.